The World Bank was founded on the principle of non-interference in the political affairs of its member countries, with the focus exclusively on fighting poverty through economic development. For decades, that meant that corruption was a taboo subject in the global discourse on development, even as it crippled the economies and societies of countries around the world. That changed on October 1, 1996 when then-President of the World Bank, James Wolfensohn delivered his famous speech at the Annual Meetings where he called corruption what it is: a cancer on development. “…we must tackle the issue of economic and financial efficiency. But we also need to address transparency, accountability, and institutional capacity. And let’s not mince words: we need to deal with the cancer of corruption. Wolfensohn made a convincing argument that corruption is not just a domestic political issue but rather a destructive force that undermines good governance and economic prospects of countries. His speech broke the wall of silence around this issue and opened the gates toward world-wide efforts to combat corruption that the World Bank and many other organizations, governments, and businesses have since embraced. Earlier this week, Transparency International-USA (TI-USA) honored James Wolfensohn for his contributions to the global fight against corruption in its annual Integrity Award Dinner ceremony in Washington, DC. Raytheon was also recognized with TI-USA Corporate Leadership Award for its commitment to anti-corruption and promoting ethical business standards. At the ceremony, Claudia Dumas, President and CEO of TI-USA said, “Sir James Wolfensohn’s words and work continue to inspire change in societies and institutions around the world.” Indeed, the global anti-corruption movement has advanced from just condemning corruption in principle to taking constructive, practical steps toward anti-corruption compliance. Progress has been made both on the public and the private sector side. Yet, much more remains to be done to spread best practices beyond leading companies to smaller firms across the global value chains. 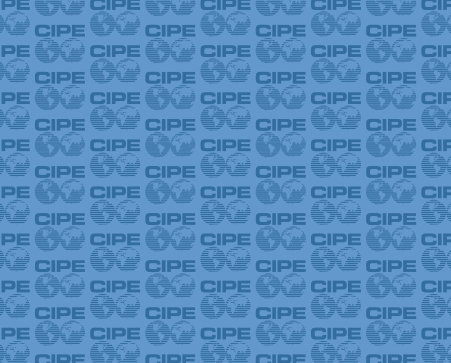 To that end, CIPE has recently published a guidebook meant for mid-sized companies in emerging markets that covers basic tenets and tools of anti-corruption compliance. The path ahead is not easy but, as we have seen in the last two decades, progress in combating corruption around the world is possible and real. Going forward the success will hinge on linking top-down efforts of organizations such as the World Bank and corporations such as Raytheon with bottom-up commitment from governments, local businesses, and civil society organizations toward a shared goal: a world without poverty – and corruption.